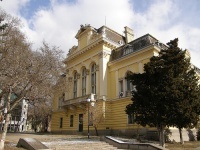 The National Ethnographic Museum in downtown Sofia has one of the richest collections of cultural artefacts on the Balkan Peninsula, representing the traditions, arts, crafts and lifestyle of the Bulgarian people from the 17th to the 20th century. The museum contains a wealth of exhibits from around the country, amounting to over 50,000 items including national costumes, jewellery, art works and musical instruments. If you are lucky, and the place is not crowded, one of the staff members may give you a personal tour. This is the best possible place to find out about local folklore and to gain an understanding of the traditional clothes (the embroidery on the borders serve a purpose in Bulgarian mythology), customs and beliefs. It is also a popular cultural and educational centre. The National Ethnographic Museum is located in the same building as the National Gallery, the old Royal Palace, and you can buy a joint ticket to see both of these worthwhile attractions if you prefer. A great museum shop on the premises sells crafts and other traditional items from all over Bulgaria - a useful place to shop for presents for those waiting at home. Address: 1 Prince Alexander Square.